This was created using the "OTP" from the Flying Unicorn September Kit of the Month - Your Passion Your Art. I thought I'd play off that age-old idiom of having "skeletons in your closet" - meaning a shocking or hidden secret from your past. 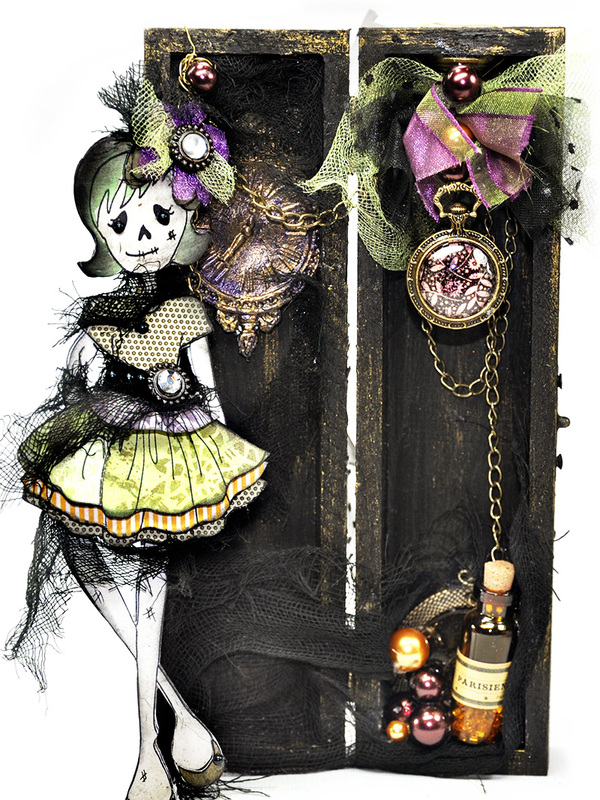 I'm turning this idiom into an actual closet for my darling skeleton doll. Let me back up a bit. What the heck is "OTP"? Often I toss around terms not even thinking of the folks who have no idea what I am talking about. I apologize. "OTP" means "off the page" - or in other words, not a scrapbook page, but an altered piece of home decor. Every month, each and every kit comes with an OTP project that you can alter and decorate anyway you choose. The options are limitless. The OTP items vary from month to month. 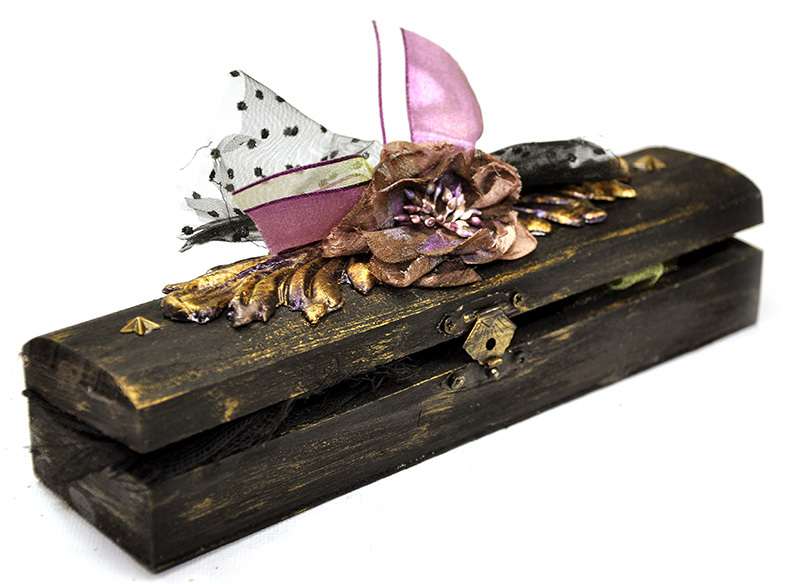 September's project was a wooden hinged box from Darice. 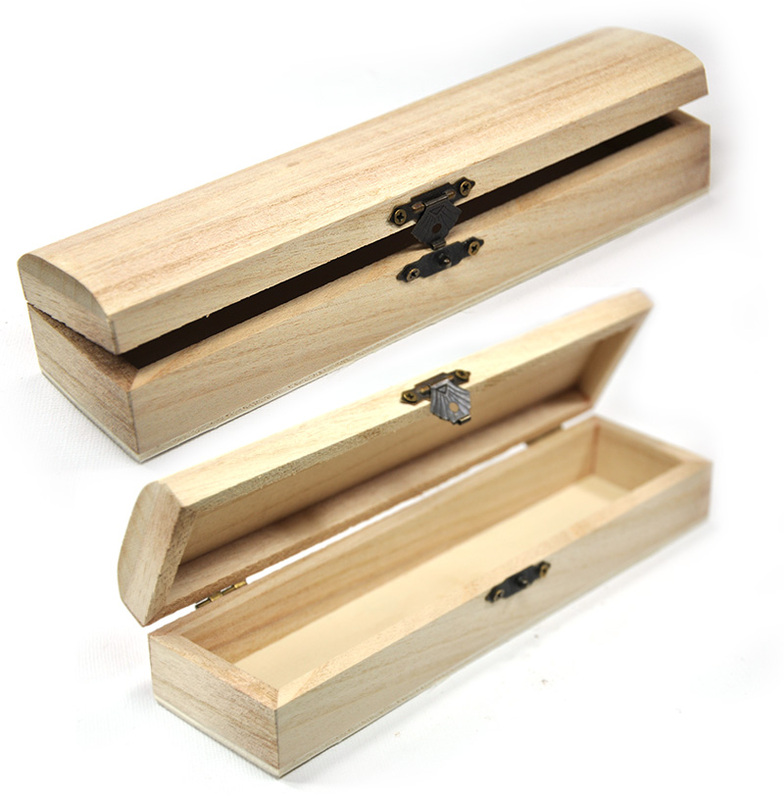 It measures 7.9x2.2x1.6 inches - perfect for something like a necklace/bracelet box or jewelry box. 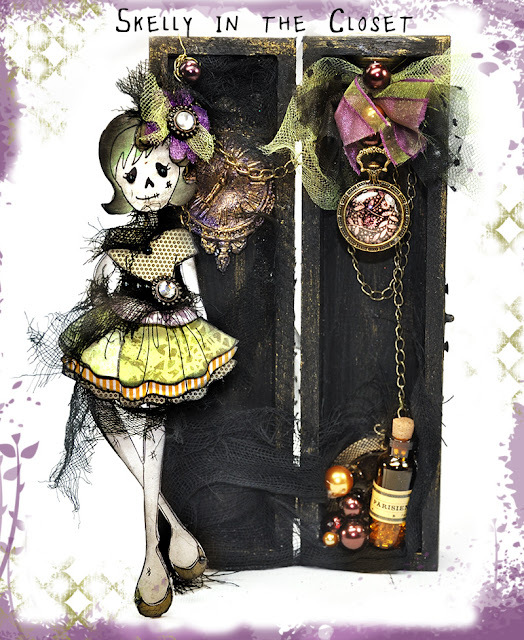 I chose to make it into a small closet for my newest doll stamp by Prima and Julie Nutting...meet Skelly. Step 2. 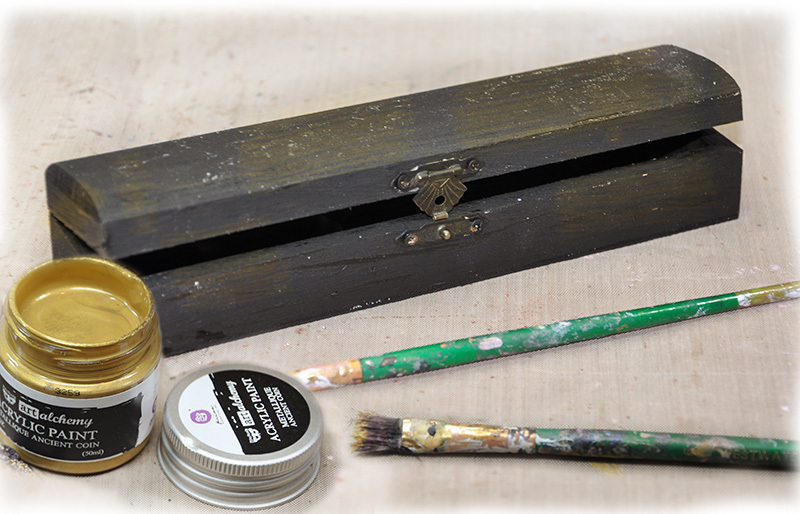 I added some gold accents to my box using the Prima Art Alchemy Acrylic Paint that came in last month's kit. It's always great to find ways to use the supplies from prior kits. I didn't add a lot, but enough to give some interest. Step 3. 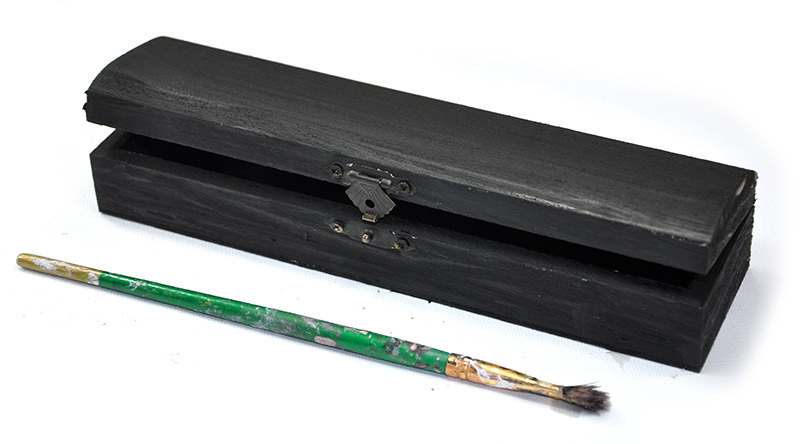 In order to gussy up the wooden box, I pulled out the Prima IOD moulds and the IOD paper clay. After I removed the paper clay from the moulds, I set the paper clay moulds on top of the wooden box to dry because the wooden box had a curved dome-like shape and I needed the moulds to conform to the box. They need to dry overnight before proceeding. Step 4. The photo below shows the steps needed to finish the moulds. 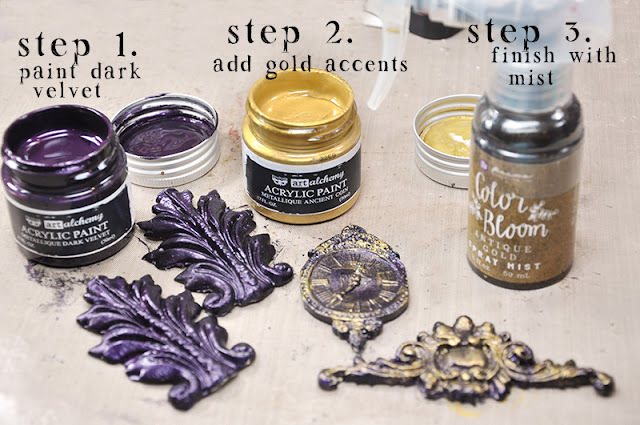 Paint with purple (Prima Art Alchemy Dark Velvet), add some gold accents ( Prima Art Alchemy Ancient Coin Gold), and top with a few sprays of gold mist ( Prima Color Bloom Mist in Antique Gold). Why bother with step 3 - mist with an antique gold color? 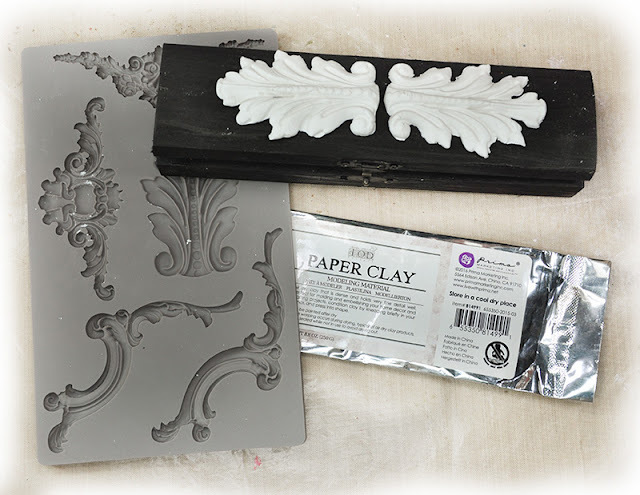 Because the mist soaks into the crevices on the moulds to enhance the details of the moulds. 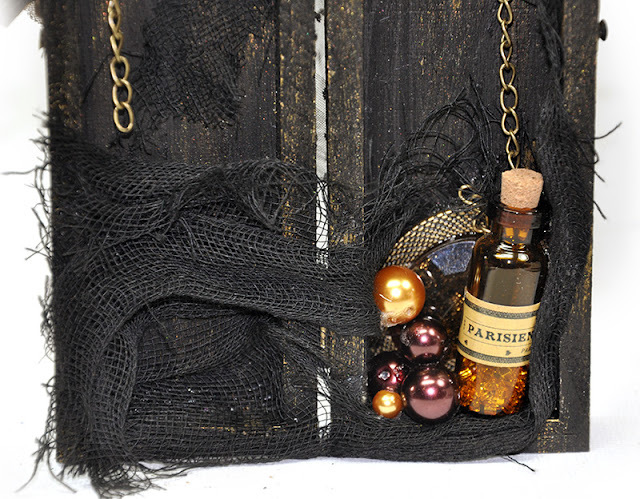 It also adds some beautiful golden sheen to the finished project. Step 5. Add ribbons, flowers and embellishments. Note - I used a super strong glue to adhere my moulds and embellishments. My glue of choice is Beacons 3 in 1 glue because it holds darn near anything in place quickly - wood, metal, fabric, plastic, foam, clay, ceramic. Plus it dries clear and without a shiny gloss finish. I even touched up my flower with some gold paint for a nice blended look. Step 1. Cut two Skelly dolls - from Prima and Julie Nutting. Step 2. One doll will be decorated and the second doll will be used for the backside as support. 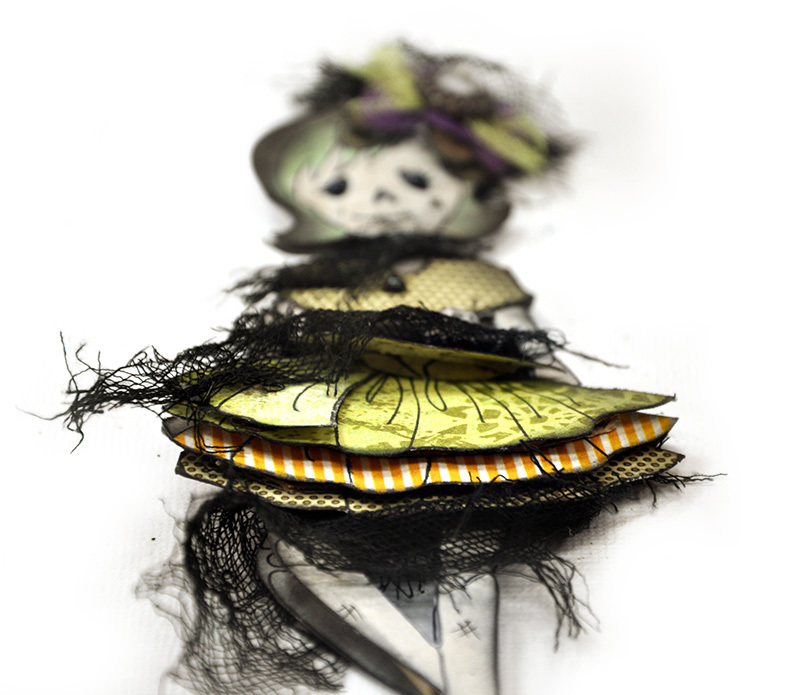 Ink the edges of both dolls with black ink for shading and blending. It's very important to make sure you ink the edges of the doll that will be used as the bottom layer. You do not want any white edges peeking out when the doll is finished. Once the doll is glued together, it's nearly impossible to add ink to the inside edges to cover up white. The extra steps and care taken ahead of time will make the finished product so much more appealing. Select the doll that will be on the backside and flip her over. 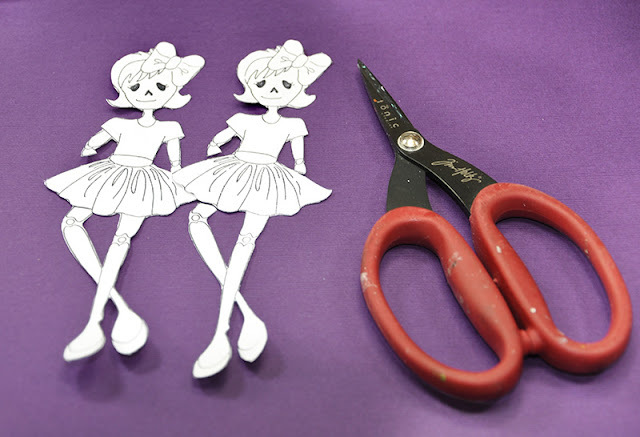 Cut some small pieces from a wood skewer and glue to the doll. Wood toothpicks will add support as well, however I always have wood skewers on my craft table so that is usually my go-to supply. Make sure you add wood supports to all areas that may bend - like the legs, neck, arms. Step 3. Color the doll as desired. Add small black pearls to the eyes and shirt as buttons. Create a statement hairbow or couture fascinator headpiece with some black cheesecloth,tulle, ribbon and a decorative brad. Skelly likes dramatic headpieces. I do too! Special tip: I bought my creepy black cheesecloth at the dollar store in the halloween decorations section. Don't have a dollar store near you? Grab some ordinary white cheese cloth that can be purchased anywhere....hardware stores in the paint department, grocery stores in the baking area, and on-line. 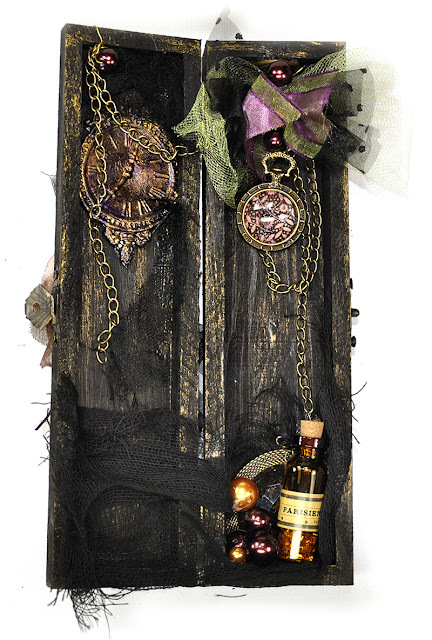 Pop your cheesecloth in a small plastic bag and mist with black mist or use black ink to transform and dye. Here's the completed look. 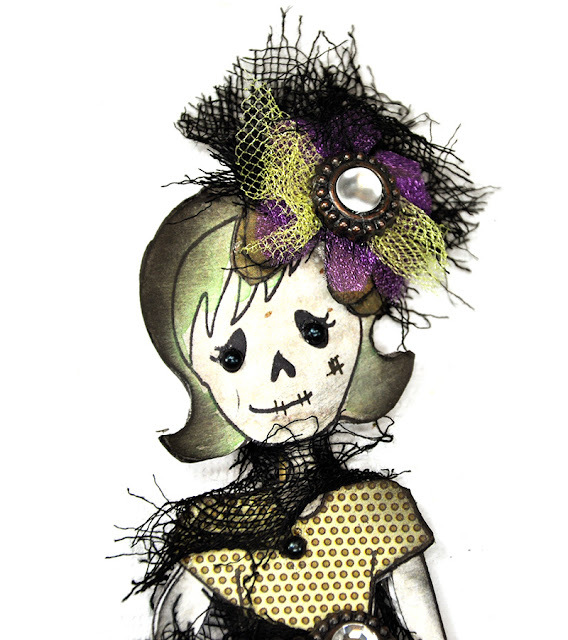 Skelly's ready to take a stroll about town and turn some heads in her new scary couture outfit. I decorated the rest of the closet box using a variety of Prima supplies from Frank Garcia's Memory Hardware collection. The complete list of products can be found at the end of this post. Note the pretty little Prima mould clock on the left side. Want Skelly to come live at your house? 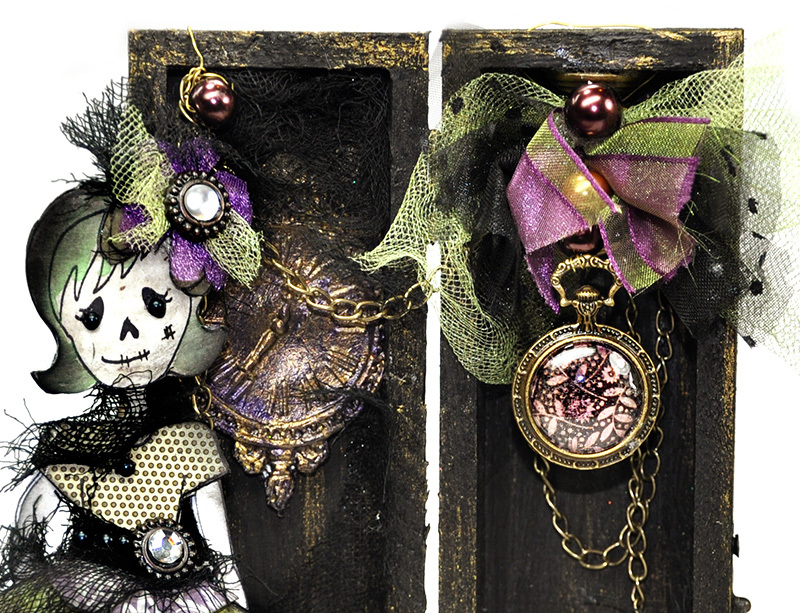 This darling spooky box and Skelly doll are available in my ETSY shop. Grab her while she is available! You can see her right here! Did you miss out this month? If you missed out on the Flying Unicorn kit for Sept., you may want to think about taking advantage of the pre-order option available on the 20th of every month. The beauty of this option is that you get to preview all the goodies in the kit and decide if it is something you will like...and of course it will be! You can find all the details here and never miss a kit that you want. Uber awesome doesn't even begin to cover it Jennifer!!! Love your project! Wow! Just WOW!!! Everything you did is amazing! 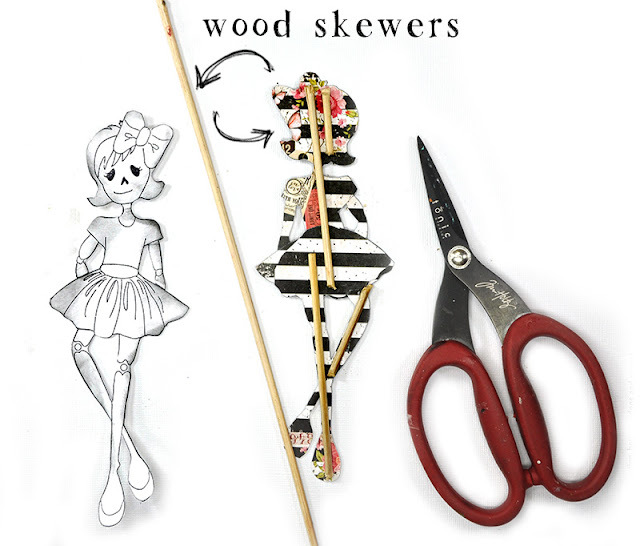 Great idea on the wood skewers for the doll. I love the box, the doll, your painting, your EVERYTHING!! Your so talented! !